Presidential candidate Rudolph Giuliani hired a Catholic priest to work in his consulting firm months after the priest was accused of sexually molesting two former students and an altar boy and told by the church to stop performing his priestly duties. The priest, Monsignor Alan Placa, a longtime friend of Giuliani and the priest who officiated at his second wedding to Donna Hanover, continues to work at Giuliani Partners in New York, to the outrage of some of his accusers and victims' groups, which have begun to protest at Giuliani campaign events. When presidential hopeful Rudy Giuliani traveled to Rome in January, he was accompanied by wife Judith and longtime friend Monsignor More Photos Alan Placa, an accused child molester. "This man did unjust things, and he's being protected and employed and taken care of. It's not a good thing," said one of the accusers, Richard Tollner, who says Placa molested him repeatedly when he was a student at a Long Island, N.Y. Catholic boys high school in 1975. At a campaign appearance in Milwaukee last week, Giuliani continued to defend Placa, who he described to reporters as a close friend for 39 years. Click here to see photos of Giuliani and the Priest. "I know the man; I know who he is, so I support him," Giuliani said. "We give some of the worst people in our society the presumption of innocence and benefit of the doubt," he said. "And, of course, I'm going to give that to one of my closest friends." The accusations against Placa were made in testimony before a Suffolk County grand jury in 2002. Tollner, now a mortgage broker in Albany, N.Y., says he was one of three people to testify about Placa. "This man harmed children. He still could do it. He deserves to be shown for what he was, or is," says Tollner. Appearing publicly for the first time today on ABC News' "Good Morning America," Tollner says the abuse started when he and Placa were in the high school making posters for a Right to Life march. "As he started to explain how these posters should be done, I realized that something was rubbing my body," Tollner said. "After a minute or two, I realized that he's feeling me, feeling me in my genital area." The grand jury report concluded that a Priest F, who Tollner says is Placa, abused the boys sexually "again and again and again." "Priest F was cautious, but relentless in his pursuit of victims. He fondled boys over their clothes, usually in his office," the report said. The report concluded that Priest F, and several other priests under investigation from the same Long Island, N.Y. diocese, could not be prosecuted because the statute of limitations had expired. Several former students from the same high school say they were asked by the "Giuliani organization" to contact ABC News and vouch for Placa. "There was absolutely not a hint of rumor of a speculation or a whisper, in four years, or in decades after of any sexual predatoriness on the part of Rev. Placa," wrote Matthew Hogan in an e-mail to ABCNews.com. In addition to the allegations that Priest F was personally involved in the sexual abuse, the grand jury also said that Priest F became instrumental in a church policy that used "deception and intimidation" to keep the church scandal quiet. Placa served as a lawyer for the diocese in dealing with allegations of abuse against other priests and, according to the grand jury report, claimed he had saved the church hundreds of thousands of dollars in his handling of possible litigation. Lawyers for alleged victims say Placa would often conduct interviews, in his priest garb, without making it clear he was the church lawyer. "He was a wolf in sheep's clothing," said Melanie Little, a lawyer for several alleged victims of sexual abuse by other priests in the diocese. "He was more concerned with protecting the priests, protecting the reputation of the diocese and protecting the church coffers than he was protecting the children," said Little. Since going to work for Giuliani Partners, the former mayor and the priest have continued to be close. 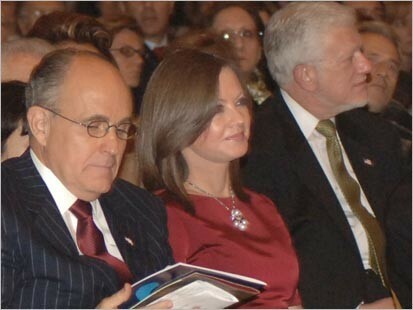 Placa accompanied Giuliani and his wife Judith on a trip to Rome earlier this year. Through a spokeswoman at Giuliani Partners, Sunny Mindel, Placa declined requests to comment on the allegations to ABCNews.com. Mindel also declined to specify what Placa does for the firm or how much he is paid. "Mr. Giuliani can do what he wants with his money, but he has to pay the price for people like myself who disagree with employing known child molesters," Tollner said. While no longer allowed to perform priestly duties or appear in public as a priest, Placa continues to maintain a residence at a church rectory in Great Neck on New York's Long Island. According to New York property records, Placa also co-owns, with another priest, a waterfront apartment in lower Manhattan in Battery Park City, valued at more than $500,000. Do you have a tip for Brian Ross and the Investigative Team?